It's the rare bride who can say with a straight face: "I actually told him I'd rather have Diamond Status than the diamond ring." Airline fanatics and Medallions Bess Wohlner and Jeremy Simons recently pledged their love in a Delta-themed wedding. 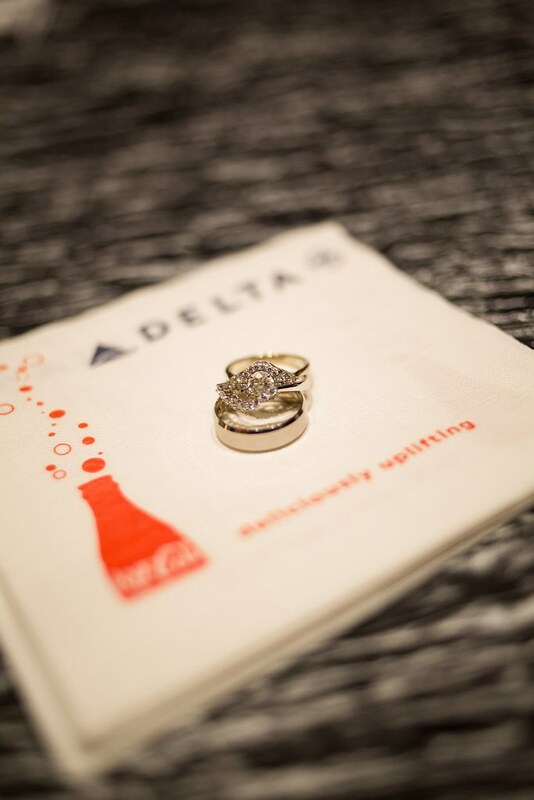 As the airline has held a significant place in their relationship, the Memphis couple thoughtfully wove all things Delta into their wedding, including airport code table assignments and boarding lanes to line the dance floor. Jeremy grew up in a family with strong Delta loyalty. He said selecting one airline to vow millions of miles to as a business traveler was "like deciding I would marry Delta." Jeremy first met Bess at a conference in 2008, before attending rabbinical school in 2009. The friends frequently flew out of Delta's Los Angeles hub for student assignments. Bess agreed to do a "mileage run" with Jeremy and purchase trips from one Delta city to the next to accrue SkyMiles. After 47 hours spent making two laps around the States without ever leaving an airport, he knew she was the one for him. Still, Bess and Jeremy parted ways for a few years until they found each other on the same flight from New York to Tel Aviv. The friends came home from their week in Israel equally smitten: "I knew it was love when he handed off one of his upgrades and delivered his first class meal to me from the front of the plane," said Bess. It was only fitting that the couple would announce their engagement with a "Diamond Status" save the date, then incorporated Delta into nearly every detail of the ceremony and reception. Guests were welcomed to Memphis with Tumi amenity kits from Delta's first class cabin. The wedding party flaunted navy blue bridesmaids' dresses and yarmulkes, and bright red accents. The officiant was a fellow Delta Medallion who flew onboard the airline's inaugural A350 flight last October. And Delta loaned Jeremy a branded mat to walk down the aisle on, as if he were strolling through Sky Priority. The guests' seating assignments were distributed on "bag tags," which sorted them into 12 tables organized by meaningful cities to Bess and Jeremy's relationship. Hors d'oeuvres were served with onboard service wear and Delta-branded cups and napkins. And as the cherry on top of the groom's Biscoff-flavored cake, dessert came on the couples' beverage carts – which they own. The guests enjoyed a photo booth with a green screen simulating an airplane interior, oxygen masks and decommissioned business seats from the couple's living room. The couple is spending their honeymoon jetting around the world in typical fashion – visiting Delta stops in Scotland, Amsterdam, Sri Lanka, Sydney, Melbourne, Vancouver, Seattle and additional SkyTeam destinations along the way. All photography courtesy of Paige Miller.